Founded in September 2013 by Jade Dearing, Sober Surfers is a non-profit organization specializing in the treatment of drug and alcohol addiction. Unlike the traditional treatment programs, Sober Surfers travels with their clients to exotic and safe third world surf locations. Staffed with licensed Marriage and Family Therapists, Recovery Addiction Specialists, a Registered Nurse, and a pool of professional surfers, an intense two week treatment program focusing on post acute withdrawal and relapse prevention has been designed. Sober Surfers also volunteers their time to a chosen charity in the communities that they visit as part of the treatment. Their goal is to help their clients reintegrate themselves into a clean and healthy environment, build self-esteem, self-efficacy and teach them healthy ways to cope with everyday life problems. What inspired Jade to develop Sober Surfers was her past experience working as a Sober Companion for a high profile “interventionist” in Southern California who operated a luxury treatment program catering to the rich and famous. Unlike the traditional treatment programs, clients were placed in a beachside home or luxury condominium staffed with two or three Sober Companions, most of them having no formal education in mental health and no licenses or credentials. During her time working for this interventionist, Jade witnessed some very unethical and unscrupulous practices. One of the only qualifications to be hired as a Sober Companion was that they were former addicts having gone through the twelve steps program themselves; this wasn’t unethical in itself, nevertheless, there were many unethical practices to note. There was no formal training or even an employee guide, Sober Companions were directed to administer prescription drugs to the clients, such as Suboxone (a potent semi-synthetic opioid to treat opioid addiction), neurontin, clonidine, remeron, depakote, and klonipin, etc., without any prior experience, credentials, or licenses, or supervision. For the most part, the owner was not present for days on end, leaving the companions with the clients with little or no direction. Not to say that the owner had any credentials or a license to run this treatment program himself. Like his companions, he was simply a former addict with a violent criminal record. In addition to this, Jade was directed to forge her initials on drug tests that were never administered to the clients to present to the courts. Jade also witnessed clients being purposely put in precarious situations where it was obvious the client could score their drug of choice. There was also a situation where a client who was addicted to alcohol and prescription drugs disclosed to Jade that the owner had shown up and had given her a bottle of wine while she was being given a cocktail of sleeping pills, bi-polar medication, anti-depressants and anti-psychotic drugs. It seemed to Jade that the strategy was to keep these clients as sick as possible in order to keep them in the program and to keep the hefty checks coming in (clients paid anywhere between $15,000 to $70,000 a month). It had become obvious that this was the only goal and purpose for “treating” these clients. All of this was clearly confirmed in September of 2010 when one of the clients had died of a heroine overdose while in this “treatment” program. She was a beautiful 21 year old girl from Beverly Hills named “Amy” and had been in the program for six months. During that time, the family had shelled out a total of $250,000 to help fight her addiction; she was given no therapy, no drug tests, no mandatory AA or NA, no treatment of any kind. Instead, she was given a cocktail of Suboxone, anti-psychotics, and anti-depressants. She was a victim placed in very dangerous situations where she was able to obtain her drug of choice. It was months of manipulation, abuse (both sexual and mental), and broken promises which led to mental relapse and her ultimate death. Jade’s goal is to build awareness of “treatment” centers that operate under unethical practices described herein. She will be helping to push through “Amy’s Law” that will ensure that treatment centers / programs are providing the proper care and treatment that those fighting addiction so desperately need and deserve. She hopes that Sober Surfers will become a model for this by building a team that possesses warmth, empathy, genuineness, acceptance, and sincerely compassionate and caring open hearts. 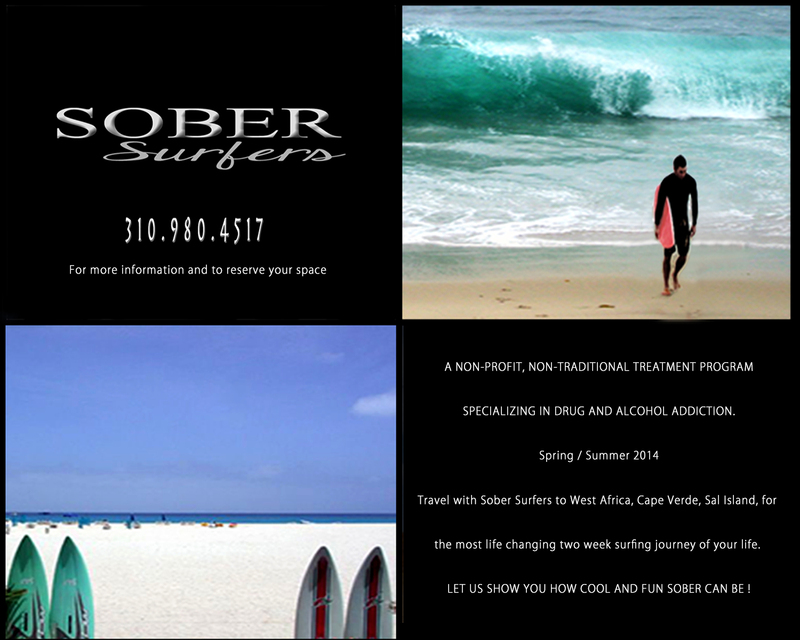 Sober Surfers is planning their first trip in Spring 2014 to West Africa, Cape Verde, Sal Island. For more information and to reserve your space, please contact them at 310.980.4517. You can visit their page and like them on Facebook.